McDonald’s is upgrading its in-store McTech: Business Insider writes that the burger chain is in the process of installing digital menu boards at all of its locations nationwide that “will make food recommendations based on the weather.” This means when it’s cold outside, the menu boards will showcase the chain’s hot coffees and more substantial menu items. And when it’s hot out, items like ice cream cones and frozen lemonades will be recommended. McDonald’s US President Mike Andres explained how the menu boards worked in an investor meeting yesterday: “[The boards] can monitor temperature outside and [they] will know which products sell better at hotter or colder temperatures and promote those products.” This means the menu board is probably more accurate than your favorite meteorologist. 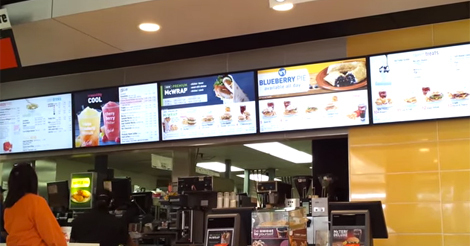 McDonald’s stores are getting fancier and fancier: In addition to the upgraded menu boards, a number of locations feature Create Your Taste kiosks where customers can order over-the-top customizable burgers. The digital kiosks lets customers pick a number of sauces and toppings, making it possible to order a $40 dollar McDonald’s burger if their heart so desires.